My colleague Daniele Stroppa sent a nice guest post that demonstrates how to use Jenkins to build Docker images for Amazon EC2 Container Service. In this walkthrough, we’ll show you how to set up and configure a build pipeline using Jenkins and the Amazon EC2 Container Service (ECS). This Dockerfile is used by the build pipeline to create a new Docker image upon pushing code to the repository. The built image will then be used to start a new service on an ECS cluster. For the purpose of this walkthrough, fork the py-flask-signup-docker repository to your account. For our build environment we’ll launch an Amazon EC2 instance using the Amazon Linux AMI and install and configure the required packages. Make sure that the security group you select for your instance allows traffic on ports TCP/22 and TCP/80. Connect to your instance using your private key and switch to the root user. First, let’s update the repositories and install Docker, Nginx and Git. To install Jenkins on Amazon Linux, we need to add the Jenkins repository and install Jenkins from there. We’ll be using Jenkins to build our Docker images, so we need to add the jenkins user to the docker group. A reboot may be required for the changes to take effect. You can launch the Jenkins instance complete with all the required plugins with this CloudFormation template. The Jenkins installation is currently accessible through the Internet without any form of authentication. Before proceeding to the next step, let’s secure Jenkins. Select Manage Jenkins on the Jenkins home page, click Configure Global Security and then enable Jenkins security by selecting the Enable Security checkbox. For the purpose of this walkthrough, select Jenkins’s Own User Database under Security realm and make sure to select the Allow users to sign up checkbox. Under Authorization, select Matrix-based security. Add a user (e.g. admin) and provide necessary privileges to this user. After that’s complete, save your changes. Now you will be asked to provide a username and password for the user to login. Click on Create an account, provide your username – i.e. admin – and fill in the user details. Now you will be able to log in securely to Jenkins. The last step in setting up our build environment is to install and configure the Jenkins plugins required to build a Docker image and publish it to a Docker registry (DockerHub in our case). We’ll also need a plugin to interact with the code repository of our choice, GitHub in our case. Now we are ready to setup and configure the ECS Command Line Interface (CLI). The sample application creates and uses an Amazon DynamoDB table to store signup information, so make sure that the IAM Role that you create for the EC2 instances allows the dynamodb:* action. Follow the Setting Up with Amazon ECS guide to get ready to use ECS. If you haven’t done so yet, make sure to start at least one container instance in your account and create the Amazon ECS service role in the AWS IAM console. Make note of the family value ( flask-signup), as it will be needed when configuring the Execute shell step in the Jenkins job. Since we have not yet build a Docker image for our task, make sure to set the –desired-count flag to 0. Under GitHub Project, add the path of your GitHub repository – e.g. https://github.com/awslabs/py-flask-signup-docker. In addition to the application source code, the repository contains the Dockerfile used to build the image, as explained at the beginning of this walkthrough. Under Source Code Management provide the Repository URL for Git, e.g. https://github.com/awslabs/py-flask-signup-docker. In the Build Triggers section, select Build when a change is pushed to GitHub. In the Build section, add a Docker build and publish step to the job and configure it to publish to your Docker registry repository (e.g. DockerHub) and add a tag to identify the image (e.g. v_$BUILD_NUMBER). The Repository Name specifies the name of the Docker repository where the image will be published; this is composed of a user name (dstroppa) and an image name (flask-signup). In our case, the Dockerfile sits in the root path of our repository, so we won’t specify any path in the Directory Dockerfile is in field. Note, the repository name needs to be the same as what is used in the task definition template in flask-signup.json. Add a Execute Shell step and add the ECS CLI commands to start a new task on your ECS cluster. To trigger the build process on Jenkins upon pushing to the GitHub repository we need to configure a service hook on GitHub. Go to the GitHub repository settings page, select Webhooks and Services and add a service hook for Jenkins (GitHub plugin). 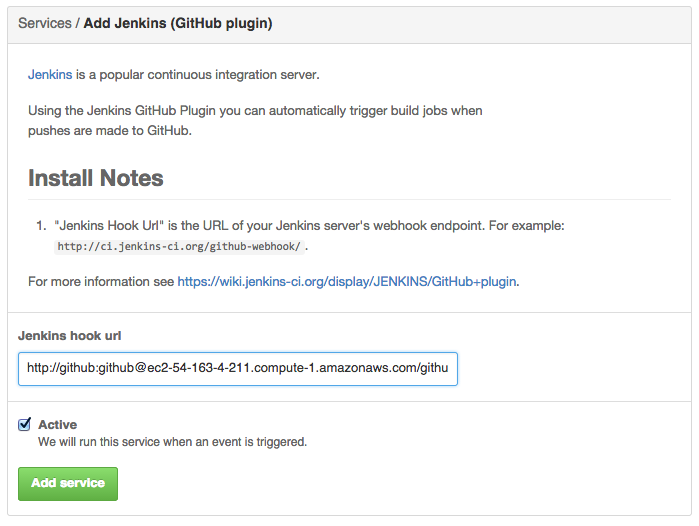 Add the Jenkins hook url: http://<username>:<password>@<EC2-DNS-Name>/github-webhook/. Now we have configured a Jenkins job in such a way that whenever a change is committed to GitHub repository it will trigger the build process on Jenkins. # git commit -m "Kicking off Jenkins build"
In this walkthrough we demonstrated how to use Jenkins to automate the deployment of an ECS service. See the documentation for further information on Amazon ECS.